Need help building your deck? Here you will find a few common tips, but for more complex designs feel free to call our design staff for free design assistance. Call us toll free at (800) 468-6081 or fill out our Decking Contact Form for a free quote. Framing your deck depends a lot on how your deck will be designed. Will it be attached to a structure with a ledger board, and how far off the ground will it sit? Regardless of the design, always use ACQ Pressure Treated lumber for your deck framing. ACQ Pressure Treated Lumber is designed to prevent rot from water damage but proper drainage is required. Joists must be spaced no more than 16" apart for 5/4" thick decking, or no more than 24" apart for 2" thick decking. Choosing a thicker decking may cost a little more up front but with proper design could save a bit on framing costs and labor. 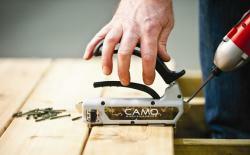 The CAMO Hidden Deck Fastening System works on any treated lumber, hardwood, cedar, composite or PVC deck board. CAMO Hidden Fasteners, a CAMO Marksman tool, and CAMO Driver Bits combine to deliver a hidden fastener deck surface at a professional grade finish. The CAMO Hidden Deck Fastening System is engineered to work exclusively together.